Note: *Hospitalization rate is the number of inpatient hospital discharges. Hospital discharge is defined as the release of a patient who has stayed at least one night in hospital. It includes deaths in hospital following inpatient care. Same-day discharges are usually excluded. Source: CICH graphic created using data adapted from the Discharge Abstract Database (DAD), Canadian Management Information System Database Metadata (CMDB), Canadian Institute for Health Information. Retrieved from Injury Data Dashboard, The Canadian Atlas of Child & Youth Injury Prevention, 2016. http://injuryevidence.ca/visualizations/injury-hospitalizations-data/ -accessed June 20, 2017. Unintentional poisoning is a leading cause of hospitalization among children under 5. 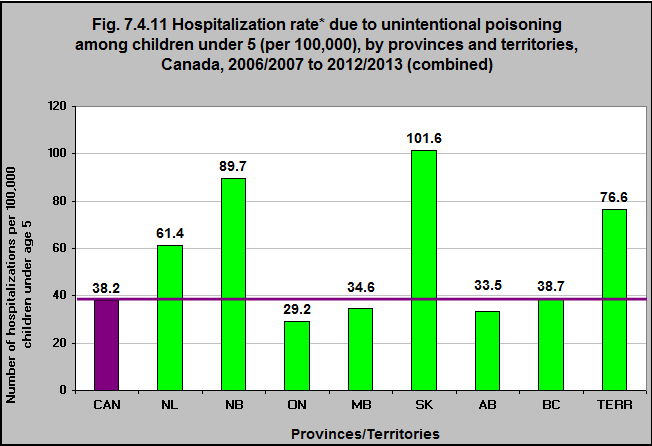 In the combined years 2006/07 to 2012/12, the hospitalization rate (per 100,000 children) among children under 5 was 38.2 in Canada. That rate varied considerably among the provinces and territories (for which data is available). The rate was 101.6 in Saskatchewan, 89.7 in New Brunswick, and 29.2 in Ontario.